By Chris Williams on April 23, 2013. If you heard that bed bug problems in the U.S. were declining…you heard wrong. A 2013 survey of pest control companies found that bed bug encounters have become even more common in public places than in previous years. And, 75% of the pest control companies surveyed encountered bed bug infestations in hotels and motels in the past year. Pest control companies report that they get more bed bug calls in the summer, presumably as a result of people traveling and unknowingly transporting the bugs back home. Bed bugs have become so much a part of our lives that they are being honored with their own commemorative week. NPMA, the national association of pest control companies, has designated April 22-28 as Bed Bug Awareness Week. In advance of summer vacations, NPMA hopes to spread awareness of bed bugs, as well as provide essential prevention information about the pests. 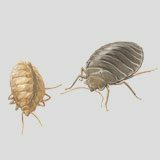 At hotels, pull back sheets and inspect mattress seams for bed bugs or telltale dark blood spots. Inspect the entire room before unpacking, including sofas and chairs and behind the headboard. Notify management of anything suspect and change rooms or establishments immediately if you suspect bed bugs. If you change rooms, don’t move to a room adjacent to, or directly above or below the suspected infestation since these rooms could also be infested. Keep suitcases in plastic trash bags or protective covers during your stay to prevent bed bugs from entering. Once home, inspect suitcases before bringing them into the house, and vacuum them before storing them again. Wash all travel clothes – even those not worn – in hot water to eliminate any bed bugs and their eggs.